Material Girl soap, shower gel, lotion and fragrance list. Refresh your skin with aloe-infused Material Girl Body Mist. Spray generously all over for irresistibly fragranced, soft, sensual skin. Enrich your skin with this irresistibly hydrating, nourishing Material Girl Body Lotion. Apply all over to hydrate, moisturize and leave skin deliciously scented and super soft. 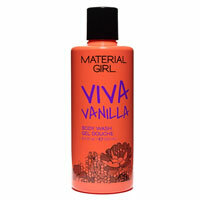 Material Girl Body Wash leaves you feeling refreshed and truly irresistible. Lather all over body for gently cleansed, delightfully scented skin. Material Girl bath and body collection: Material Girl Collection is a fashion line created by Madonna and her daughter Lola in 2010, sold at Macy's, in partnership with Iconix Brand Group. They added a bath and body line in 2011, but it has since been discontinued.